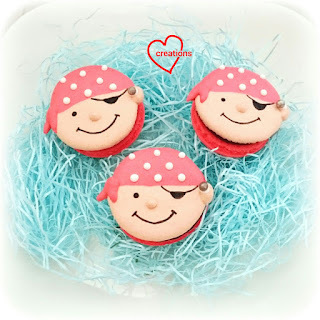 This is an overdue post of pirate macarons that I made some time back. Don't they look so cheerful that they put a smile on your face? 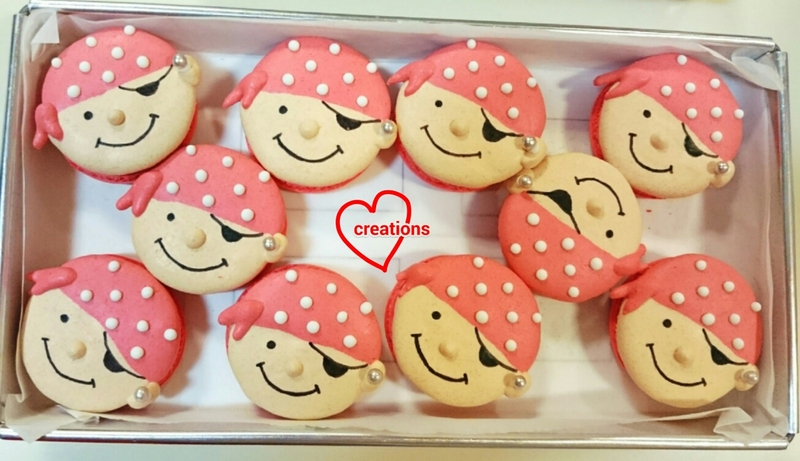 If they look familiar, that's because I made them more than a year ago for a sea themed party over here. I baked these friendly pirates along with the request for Lego Friends themed macarons. Freshly baked shells along with the Lego Friends bake! Decorating with royal icing and edible black marker. 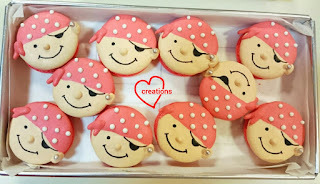 I used silver dragees for the earrings, stuck on with a bit of royal icing. 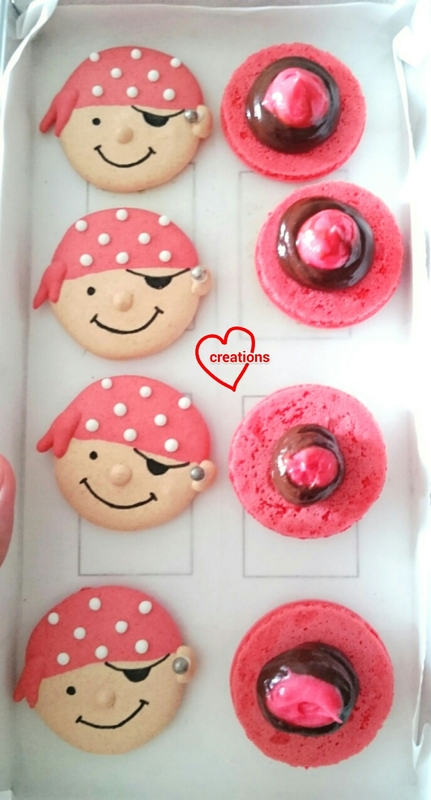 I filled the pirates with strawberry and dark chocolate ganache. 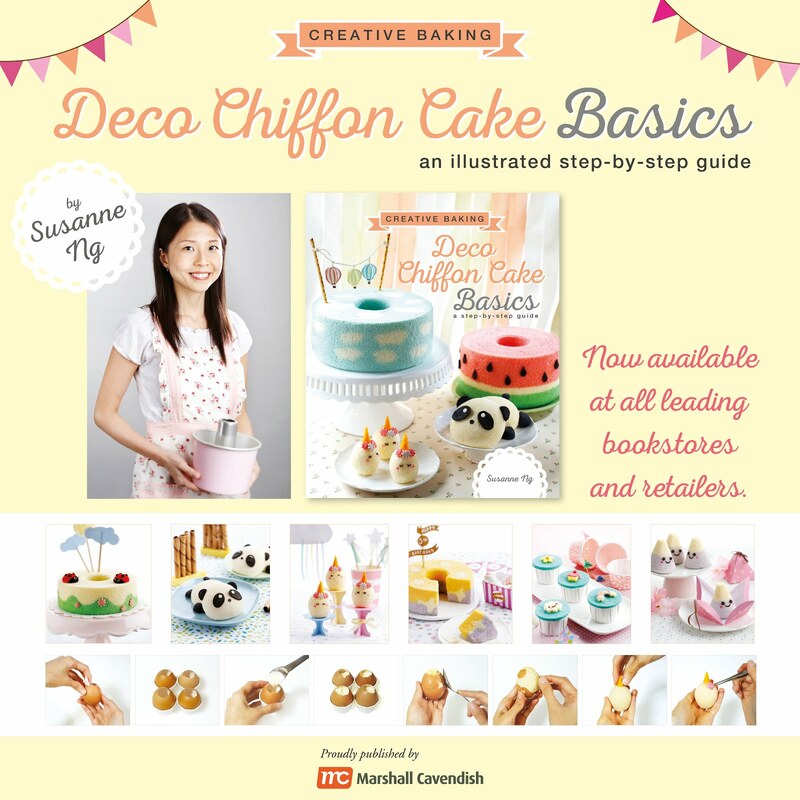 The recipe for both types of fillings can be found here. 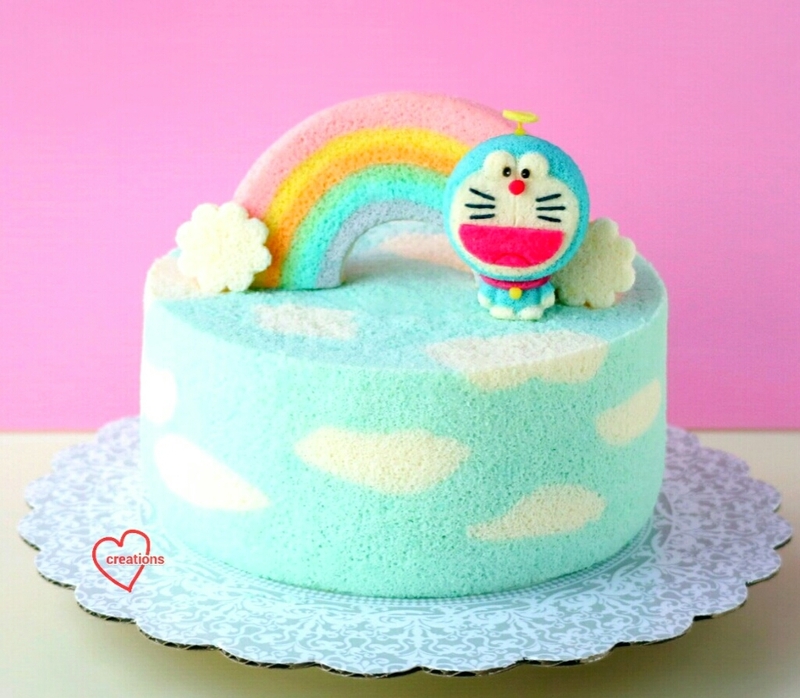 Here’s my Guji Guji 拜年! 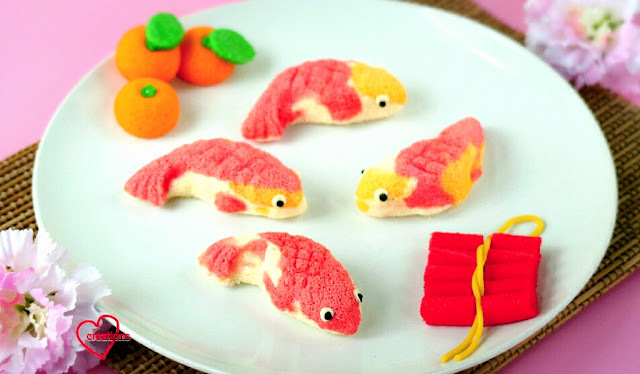 Wishing everyone a Happy, Healthy and Propserous Lunar New Year! 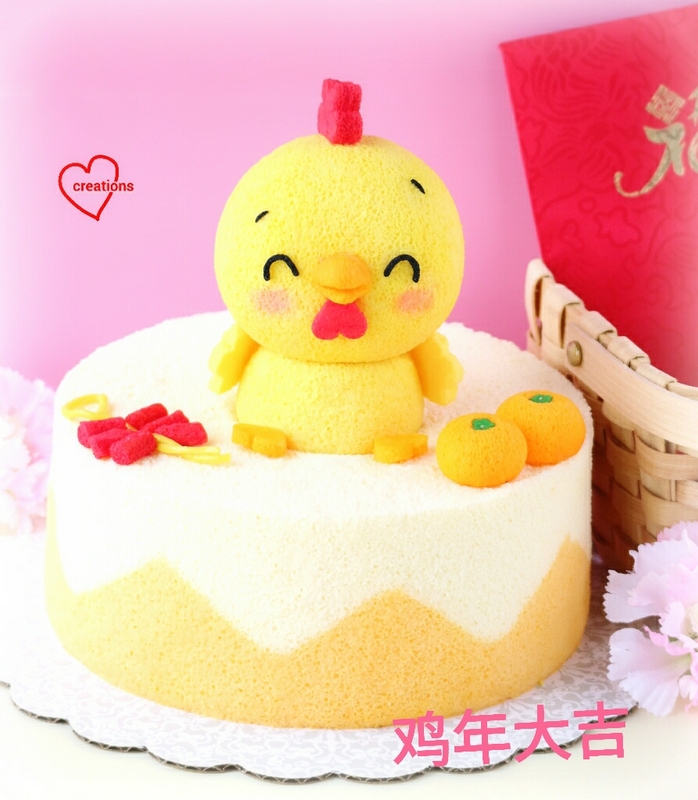 The cake is inspired by Guji Guji (咕鸡咕鸡), Mediacorp’s adorable chicken mascot this year. I’m sure we’ve all seen the cute Guji Guji dancing on TV and all over Singapore! 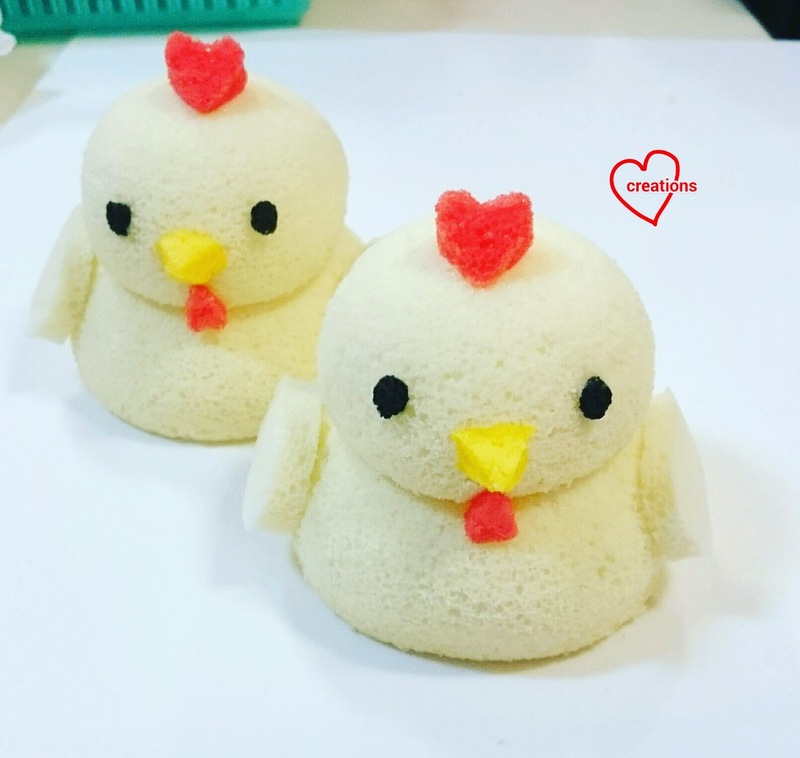 My friend sent me a photo of the plush Guji Guji toy she loves and asked if I could make it for her family reunion. I tried out a two-tone ‘hatching egg’ design for the base chiffon cake, using yuzu-orange dual flavours (yuzu top, orange bottom). 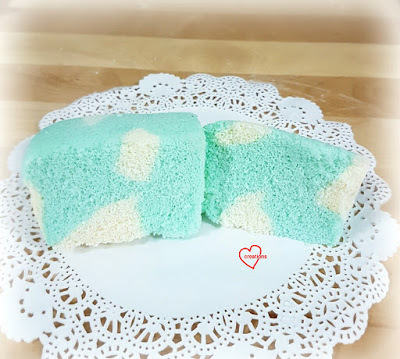 The zig zag design is actually similar to my Seawaves cake in Deco Chiffon Cakes, so you can find more picture tutorials there. The Guji Guji is made from lemon chiffon cake, by joining two bowl cakes, one for body and head. 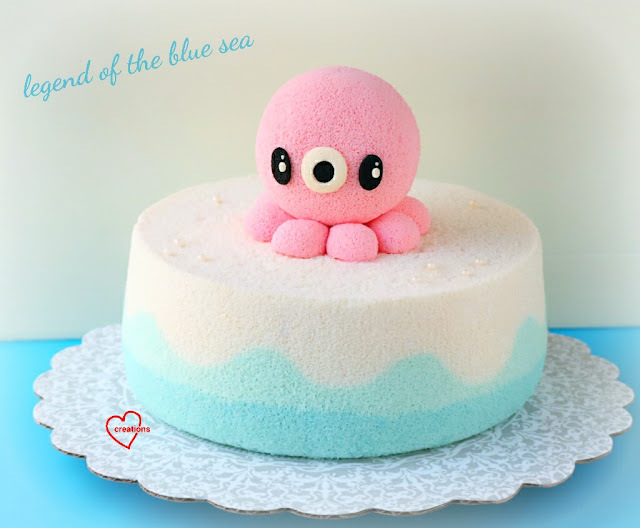 The rest of the details were cut from sheet cakes. Honored for my Guji guji cake to be regrammed by Mediacorp Channel 8 @ch8sg on their official Instagram account! My friend tasted my Pandan kaya gula melaka cake I made for her last year and loved it so much she wanted more for her birthday this year! 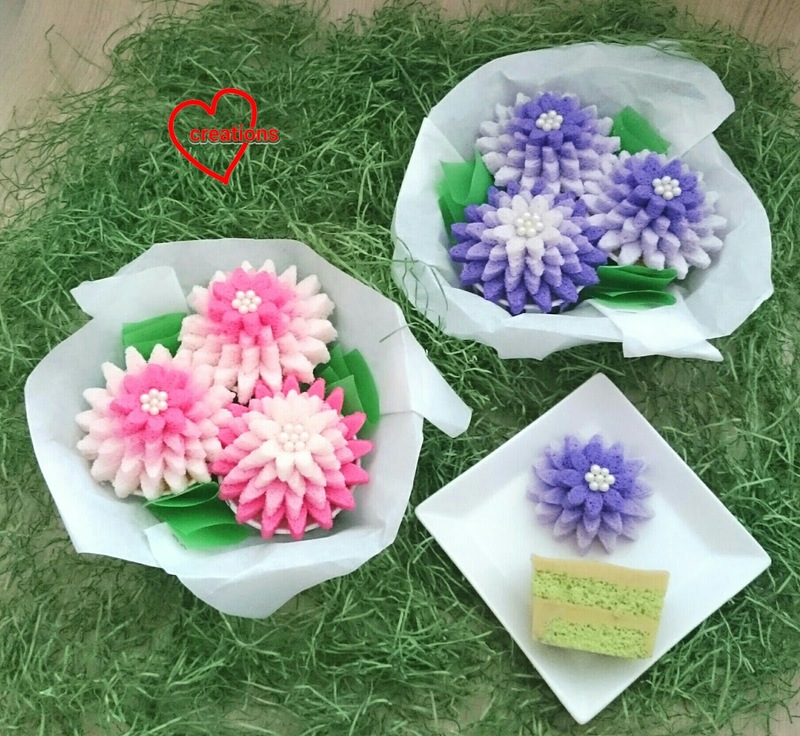 I decided to make something in sweet ombre theme for the flower cupcakes she requested this time. Presenting my version of ombre dahlias! 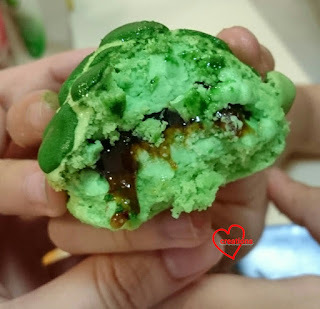 The detailed recipe and assembly steps of the Pandan kaya gula melaka cupcake can be found here so I will not repeat it in this post. 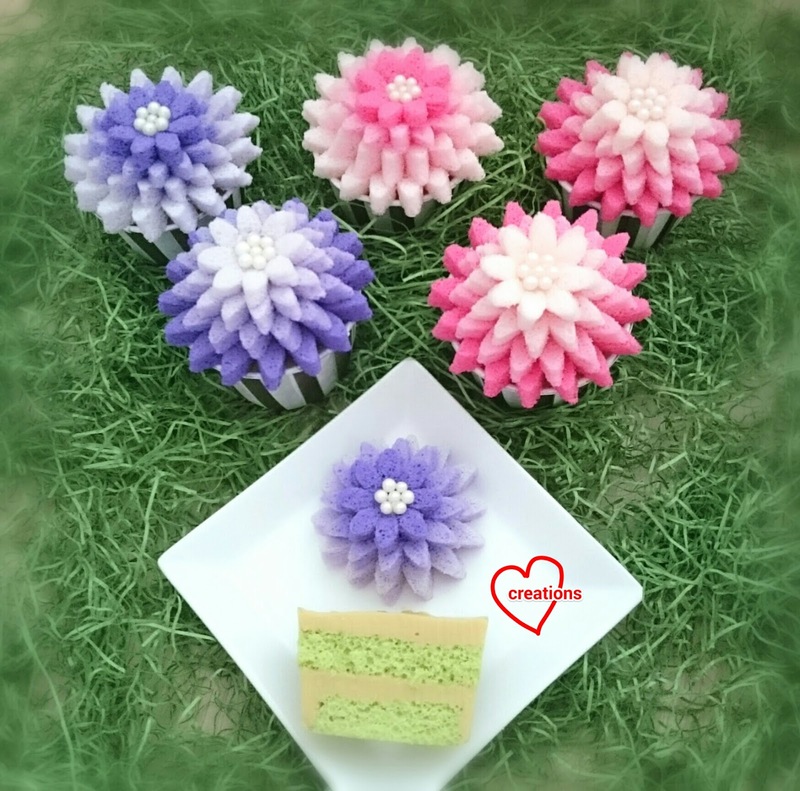 What I will focus on is the change in recipe I did for the sheet cakes for the flowers. 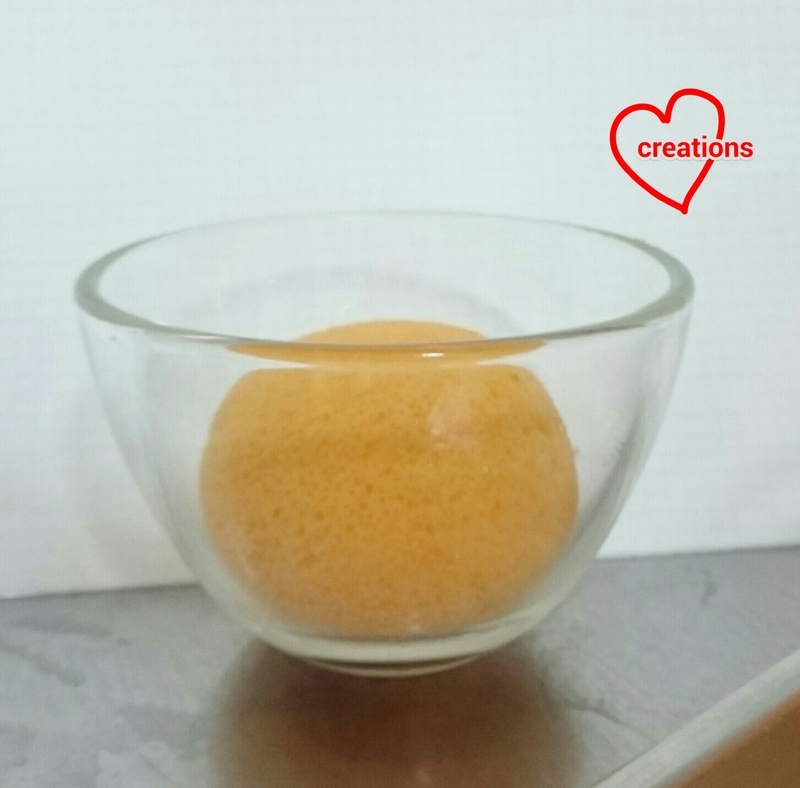 Very often people ask how do you get certain colours right because of the yellowish nature of the egg yolk batter. 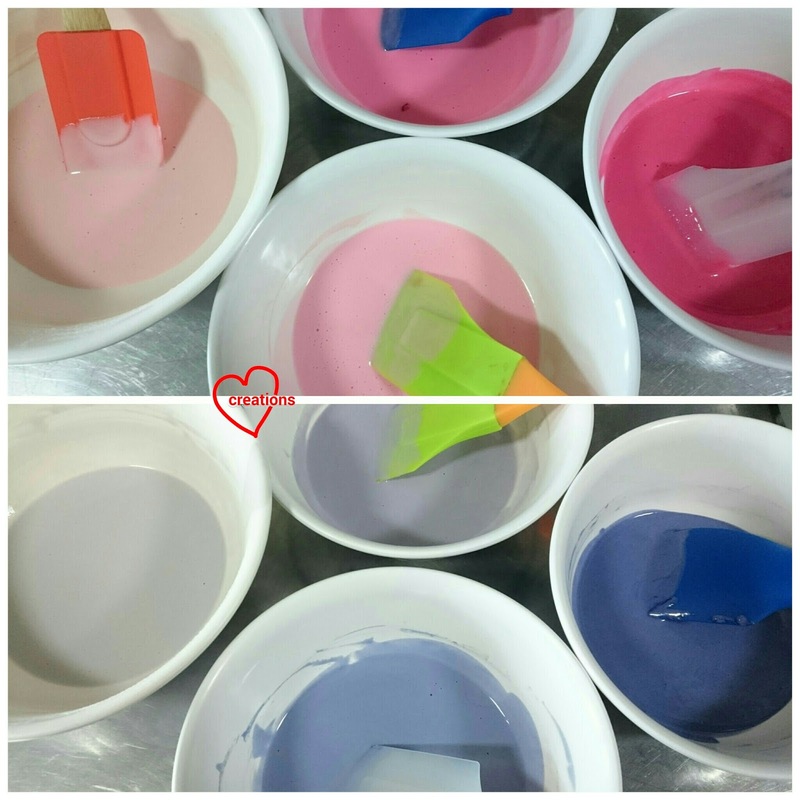 By reducing to one yolk, it helps especially for colours such as blue, purple and pink which will turn out green, grey and orangey respectively due to the yellowish undertone. But I thought of using whole egg this time to increase the moisture content (increasing water and oil doesn't have the same effect). 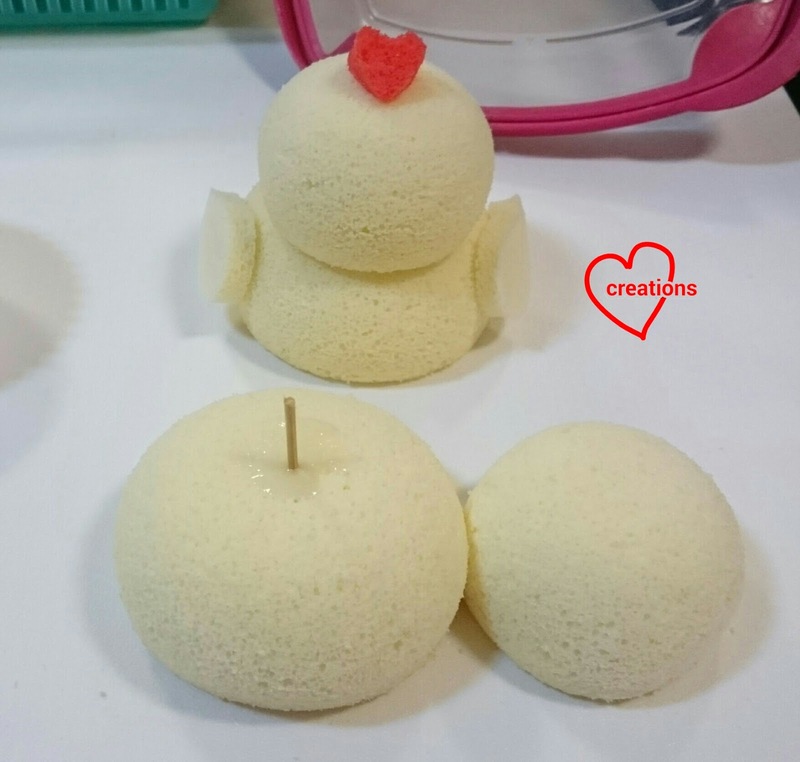 The texture is indeed smoother and softer! Note that the sugar content is quite low in the recipe. 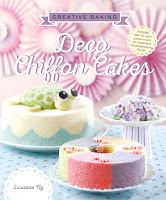 This is to compensate for the sugar syrup which will be brushed on during assembly to keep the cake moist with storage. I have briefly mentioned how to assemble the dahlias in this post but will update with some step by step photos. Note: this portion of batter is enough for about 9-10 dahlias. 1. Weigh your bowl for egg yolk batter to help you divide it more easily later on. Line the baking trays with baking paper. Preheat oven to 170°C and set oven rack to second lowest position (note that we usually use 160°C as starting temperature. 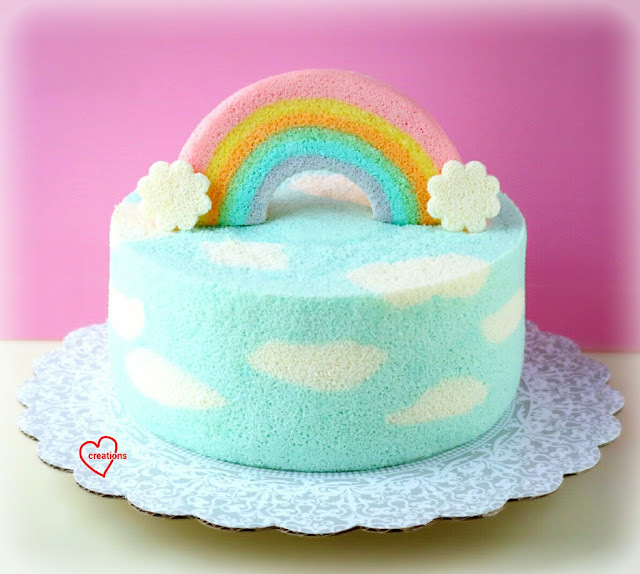 I realise that I get better quality sheet cakes if I start with a higher temperature for the first few minutes then lower it to 150°C for the later few minutes of baking time. Your oven may be different from mine so adjust the temperature accordingly). 2. Prepare egg yolk batter. Beat egg and sugar until pale and thick. I used a hand whisk to whisk for about 5 minutes. You may use an electric mixer to do the job. Add oil and whisk until well combined. Add water and flavourings and mix well. Gradually add in sifted flour and salt and whisk until no trace of flour is seen. 3. 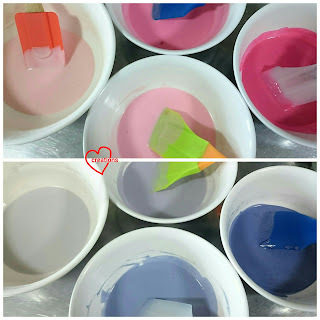 Portion the batter into the number of ombre colours that you would like. If your oven is not big enough to accomodate the two baking trays, you may wish to divide the meringue ingredients into two. Colour the batter accordingly. 4. Prepare the meringue. 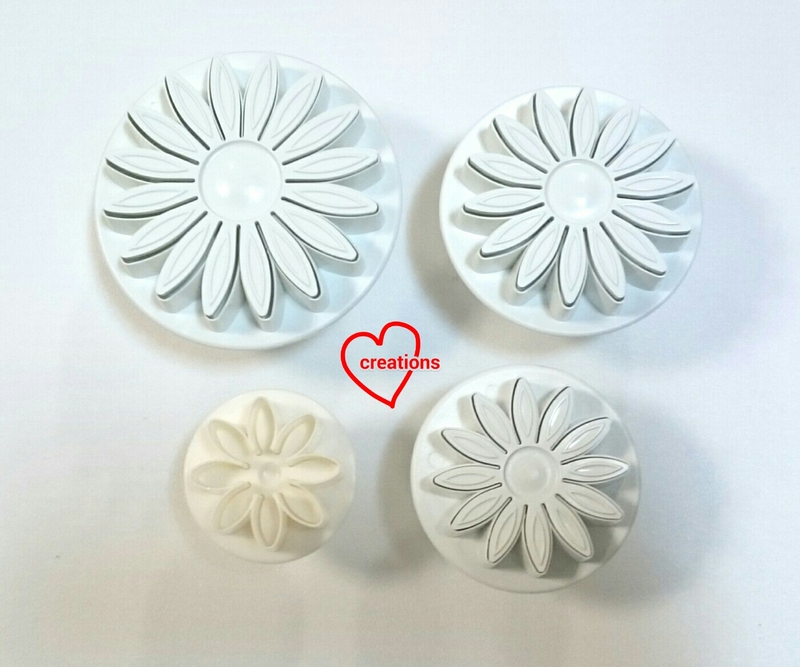 In a clean metal bowl, beat egg whites and cream of tartar until firm peaks form or just reach the stiff peak stage, gradually adding sugar once soft peaks form. 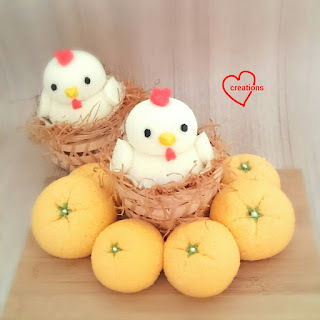 I find that it helps to use medium speed instead of high speed to beat the egg whites so that you can monitor the stage of meringue more carefully without over beating. 5. Fold the meringue into the various egg yolk batters quickly but gently in two batches. Pour the batter onto the baking trays such that a thin layer of batter is in the tray, about 1cm or less. Tap the tray on the table to release air bubbles. 6. Bake for 3 minutes and then turn the temperature down to 150°C and bake for another 6-7 minutes or until toothpick comes out clean. 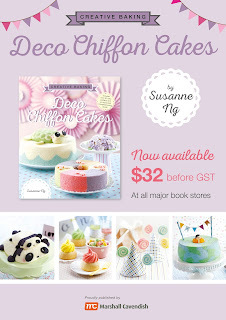 Immediately flip the cakes onto another baking sheet and gently peel the baking sheet off the cake. 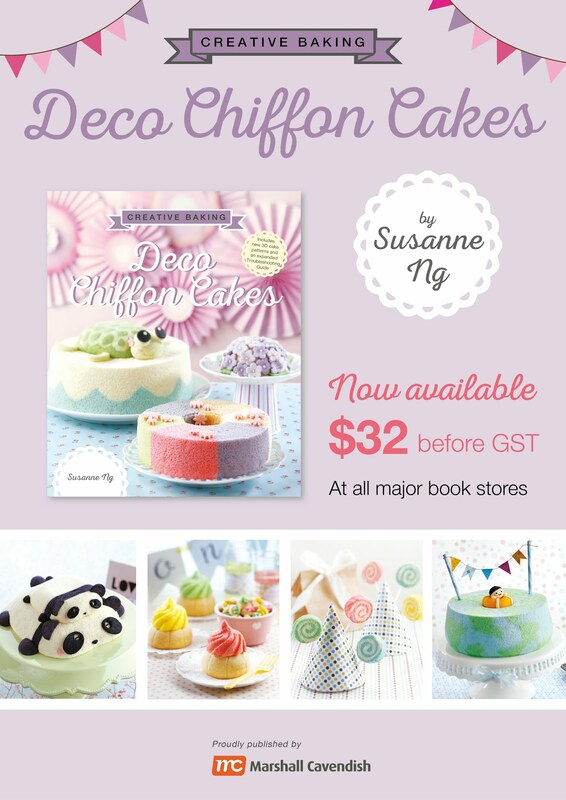 Cool the cakes before using as deco or clingwrap (double layer) and store in freezer. 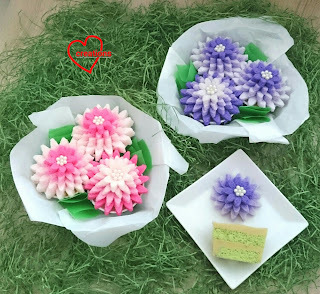 I used 4 different flower cutters to cut out the cakes. 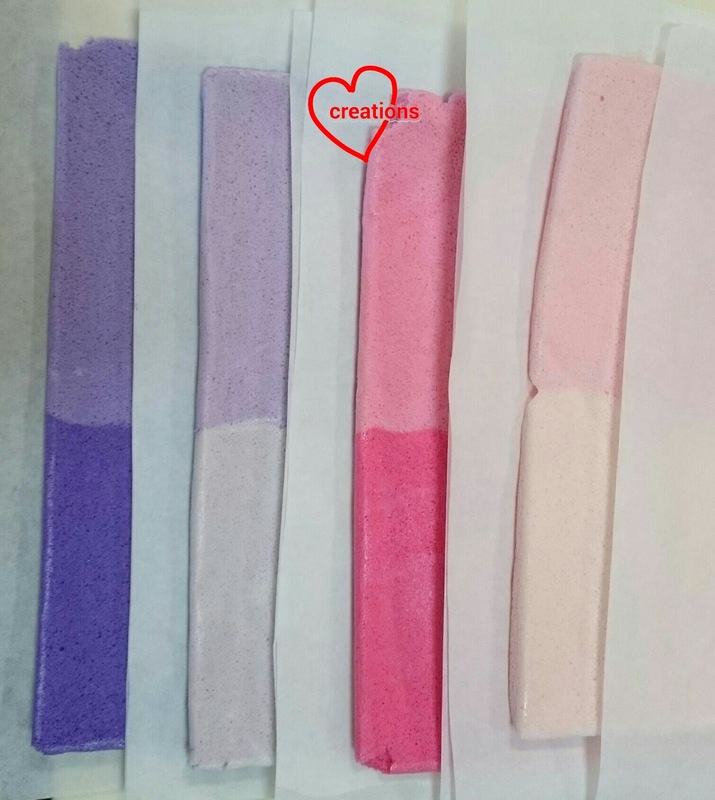 Here are the ombre cutouts! Use a circle cutter to cut out the center portion of the biggest cutout. 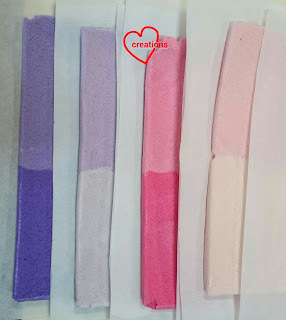 Use melted marshmellows as glue to stick the layers on. Gently press the middle of the subsequent layers into the depression at the middle. You may need to use a chopstick for the smallest cutout. Stick some white dragees in the middle and brush with syrup to keep the petals moist. All ready for the birthday girl! Sometimes I get inspiration from nowhere and this is one occassion. I have been wanting to explore the possibilities that came with my discovery of making 3D macaron shells last year. 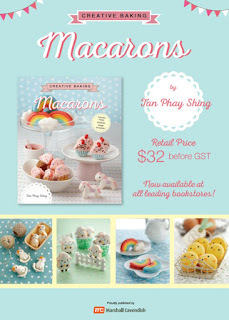 I finally have the capacity and chance before getting really busy with planning for macaron classes (Yes! I am finally giving classes!) 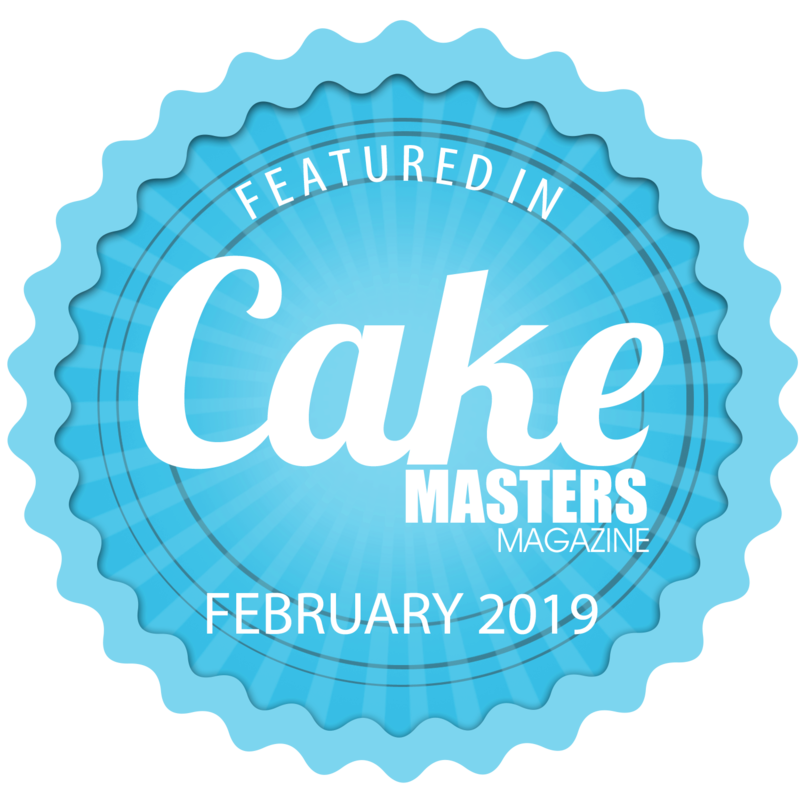 and making lots of macarons in February. Here's my version of ondeh-ondeh, macaron style 😉! 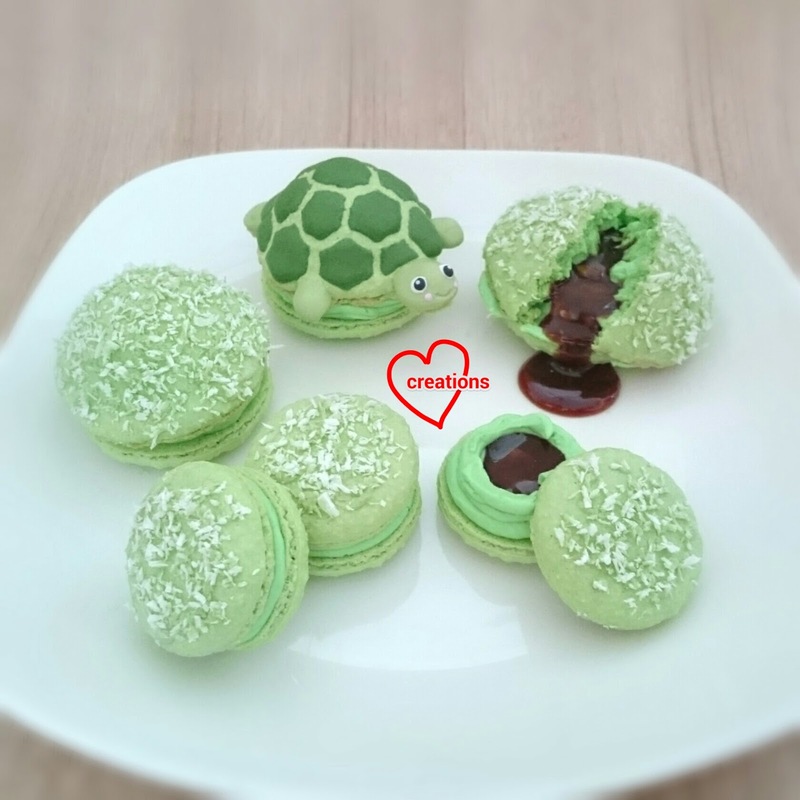 Checkout the oozy gula melaka filling and the cute turtle too! A view from the side to see the hemispherical shells more clearly. 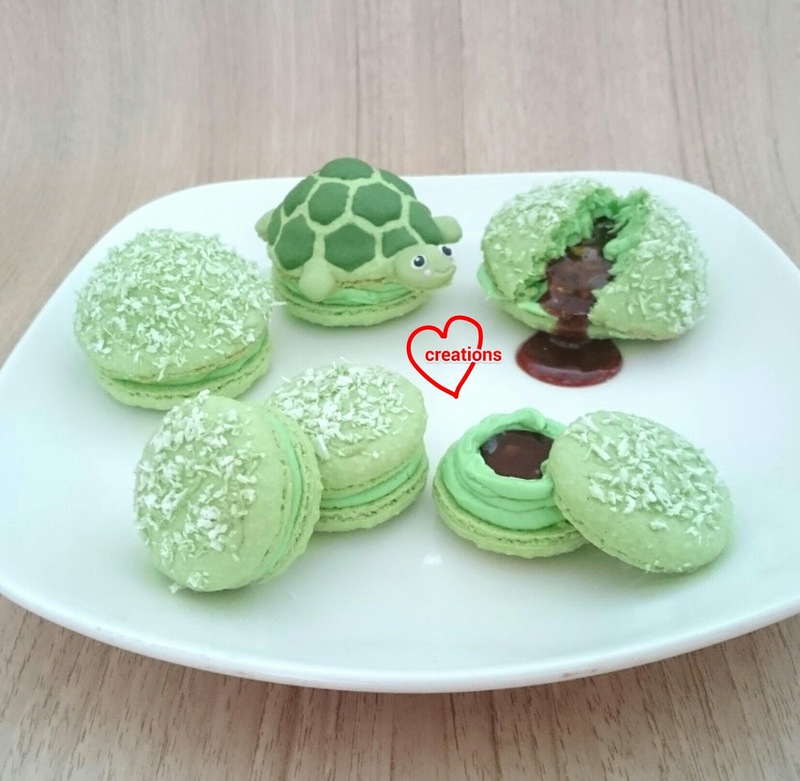 Both my kids loved the taste of these ondeh macarons and couldn't wait to get their hands on the turtle! 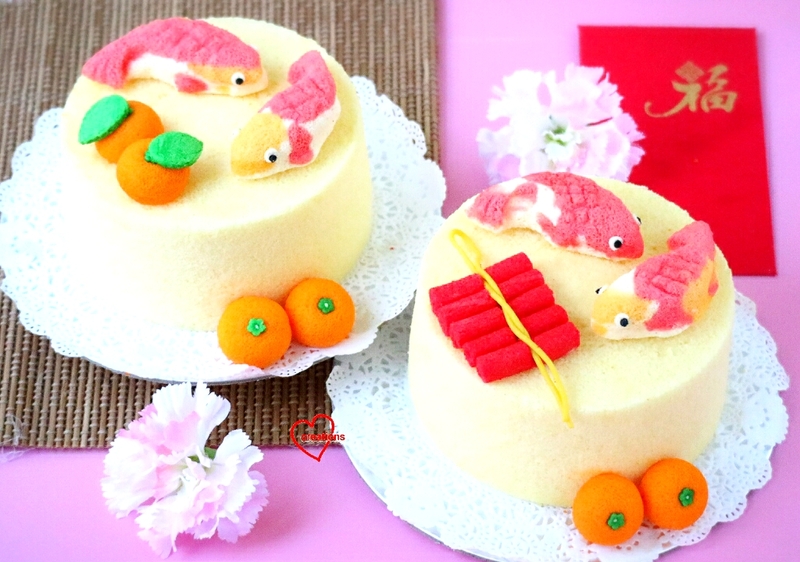 I am really happy that this concept of incorporating runny fillings in 3D shells work and opens up the avenue of other trendy runny fillings that are perhaps not so sweet. For those of you who know me, I don't have a sweet tooth and therefore my bakes tend to be less sweet. 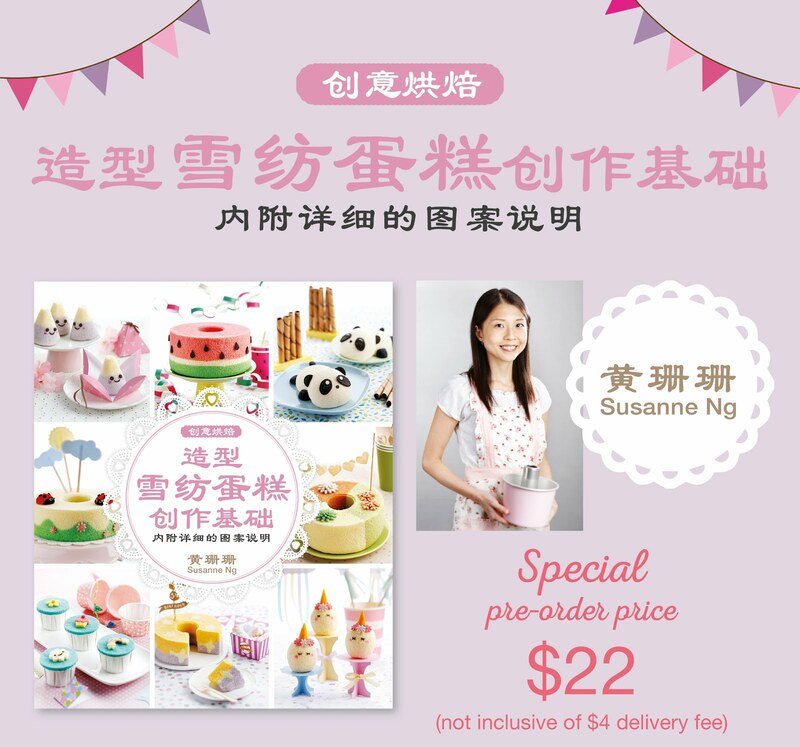 I tried by best to reduce sugar in this recipe. Knowing that the end product would be pretty sweet, I reduced sugar for both shell and ganache in an attempt to make it less cloyingly sweet. It's my first time incorporating dessicated coconut into the shells as well. It really makes the shells very fragrant with an added coconuty bite! As this was an experiment and I didn't have any macaron request pending at the moment, I used the French method to make a small quantity of macarons. My preferred Italian method would have wasted too much resources if this experiment failed. 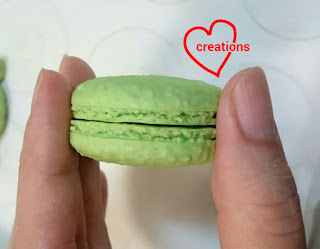 I strongly recommend you to refer to this post for the basics of French macarons. 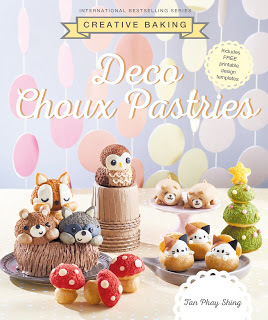 *Replace with icing sugar for non-reduced sugar version. 1. Sift almond, dessicated coconut, icing sugar, rice flour, cornflour and salt together. Set aside. 2. 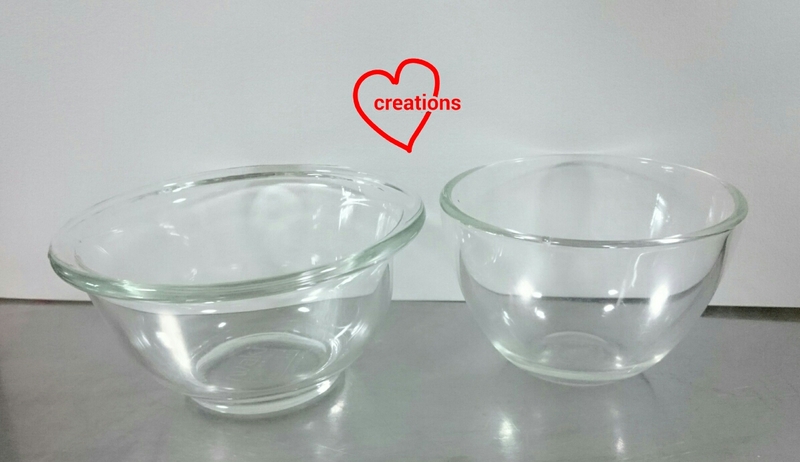 In a clean metal bowl, beat egg whites with cream of tartar until foamy with an electric mixer. Gradually add caster sugar and beat until stiff peaks form. Once stiff peaks are formed, scrape the meringue down from the sides of the bowl with a spatula and beat for several seconds more to ensure that the meringue is really stiff. Use medium speed to beat the meringue. 3. 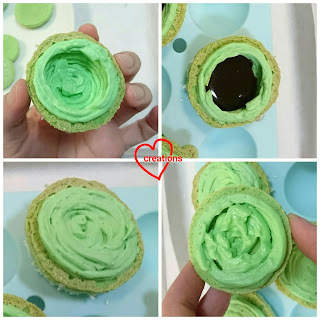 Add Pandan paste into meringue and briefly mix it in with mixer. 4. Scatter about a third of the dry sifted ingredients over the meringue. Gently fold in using a spatula. Repeat until all dry ingredients are added. Test the consistency of the batter. If it has not reached the slow moving lava-like stage, continue to fold. You may use more force to knock out more air in the batter. 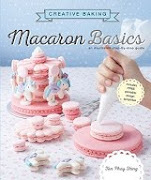 You may refer to this post for some video tutorials on macaron basics. 5. Transfer batter into piping bag fitted with a 6-7mm diameter round tip. 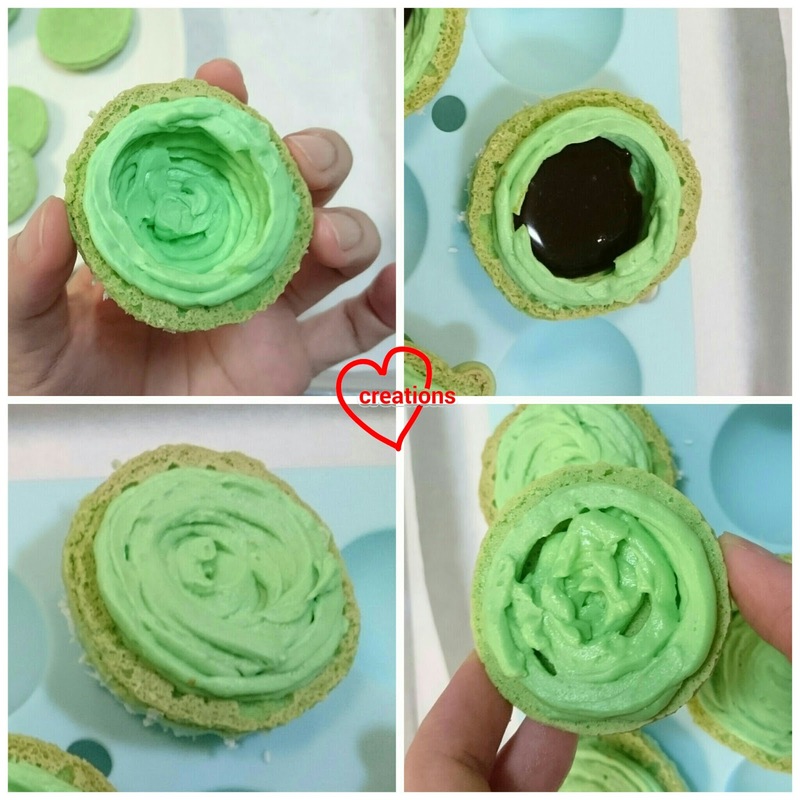 If you are making regular macarons, simply pipe out the circles on tray lined with baking paper. You may use a circle template if you wish. 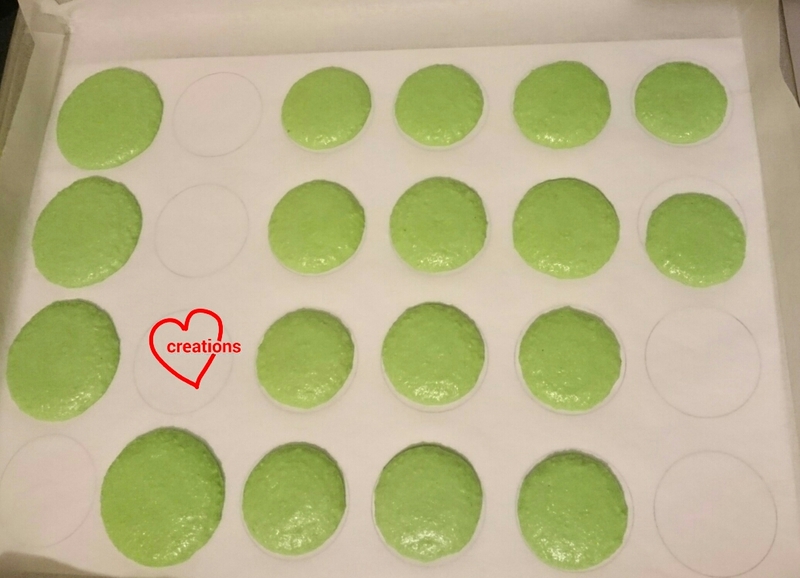 I piped some bigger circles for the base shells of the 3D macarons. 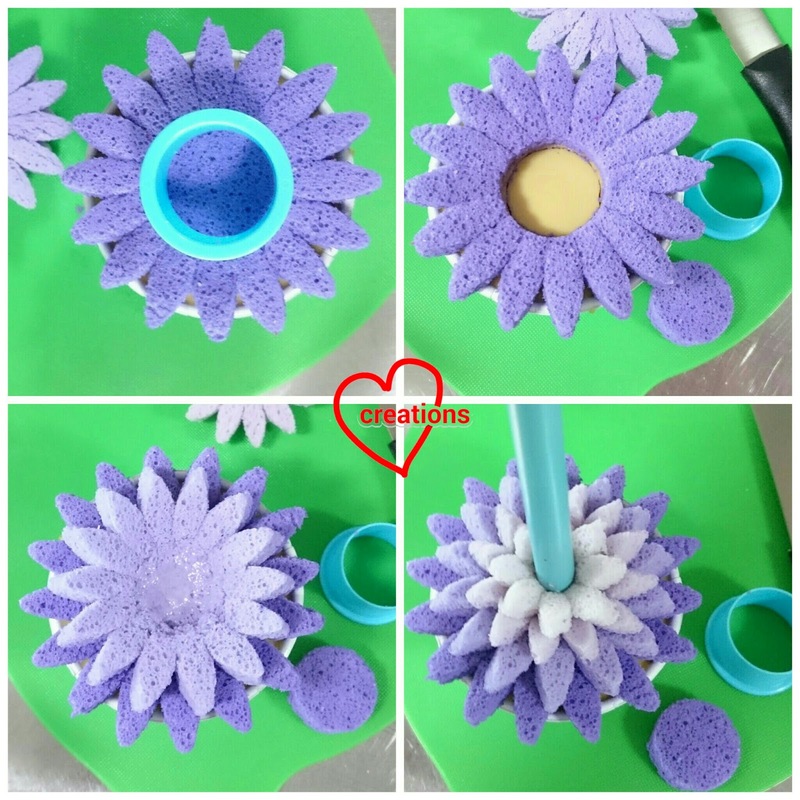 In order to pipe the 3D shells, use an inverted silicone cakepop mould as the surface and pipe away! You may have noticed that the surface of the shells appear rougher than usual. This could be due to the addition of the coconut. 6. Bang the tray on the table to release trapped air. 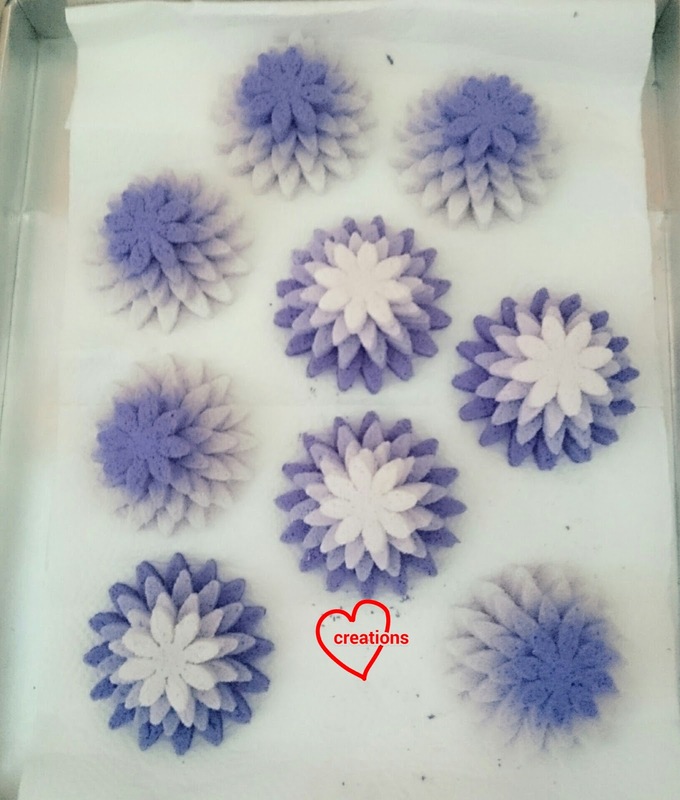 Let the shells dry in an air-conditioned room or under a fan until the surface of the shells are dry to touch. 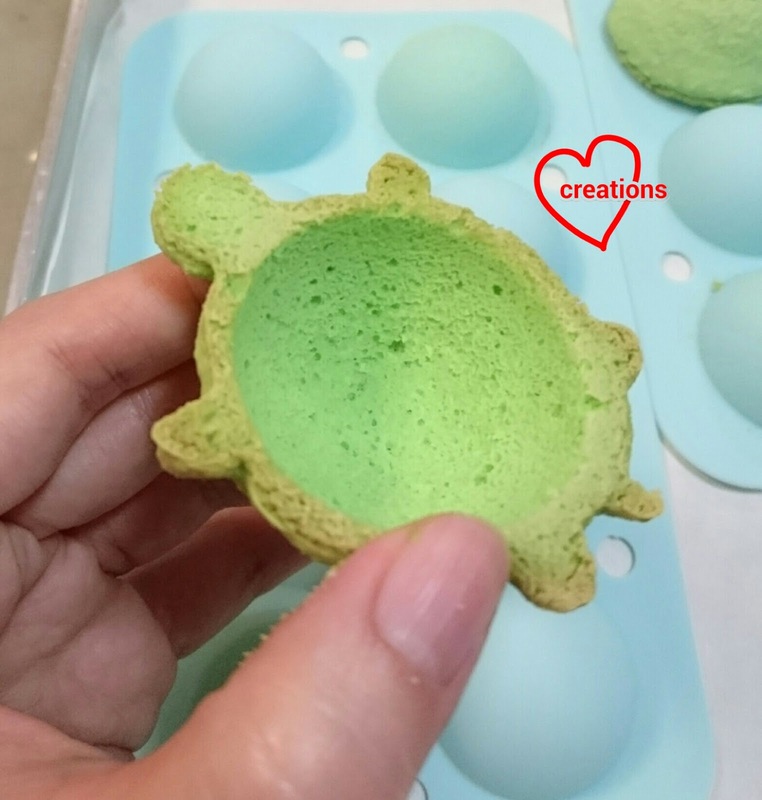 When shells are almost dry, preheat the oven to 160°C and set oven rack to lowest position. 7. 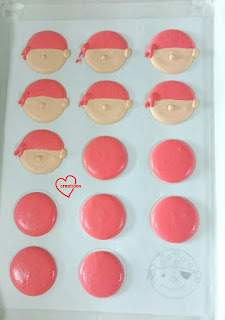 Place macarons in oven and turn down the temperature to 140°C. Use only top and bottom heat. Bake for 18-25 minutes or until feet appear dry. You may reduce the temperature to 115°C after 15-20 minutes of baking. 8. 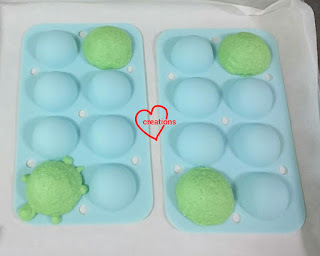 Cool the shells completely before peeling the baking sheet or silicone mould away from the shells. Really happy with the texture of the shells even though the surface is rough! Delicate and only slightly chewy. No hollows! 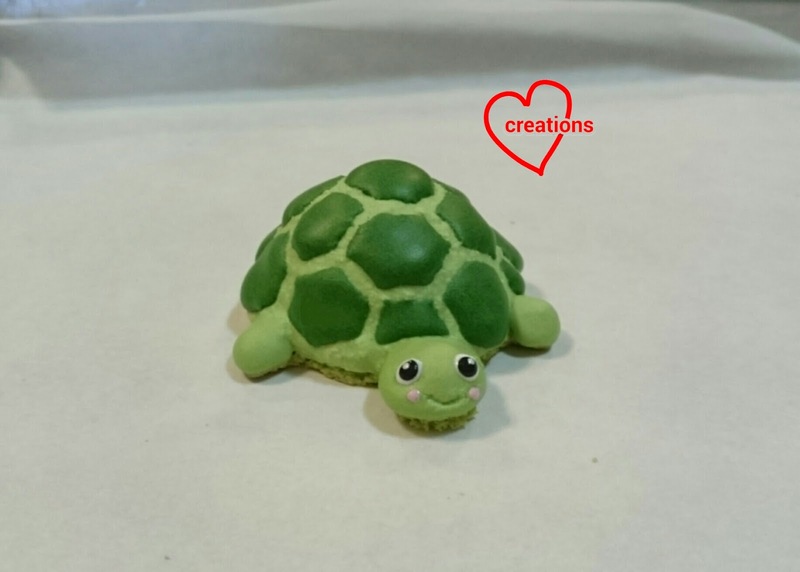 Use royal icing to decorate the turtle. Steam about 2-3 tbs of dessicated coconut with 1/2 tbs of water sprinkled over it for about 10 minutes. 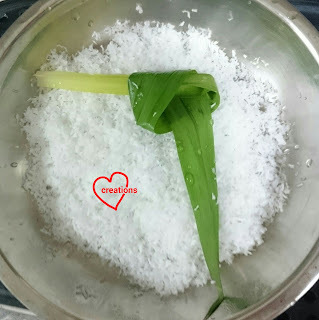 Add a knotted Pandan leaf as well to add that fragrance if you wish. Set aside to cool. You may omit this if you prefer to leave the top surface of the macaron shells clean and free from toppings. I piped a little royal icing on top of the shells to stick the steamed dessicated coconut on. You may use melted marshmellows as glue too if you don't want to mess around with royal icing. 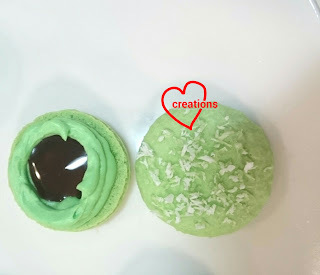 The macarons are filled with a ring of Pandan caramel ganache and gula melaka caramel in the middle. 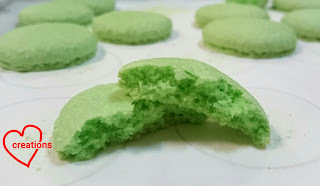 My original Pandan caramel ganache recipe here would be too sweet for pairing with gula melaka so here's the reduced sugar version. Prepare the gula melaka filling first. 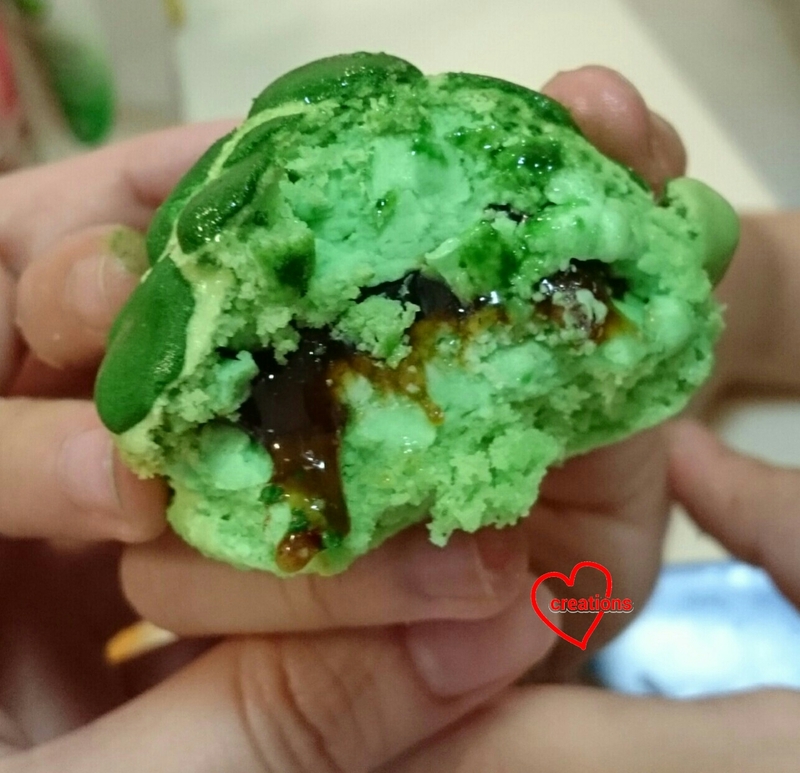 In actual ondeh-ondeh, the gula melaka centers are simply chopped up pieces of the sugar. But the centers turn runny when the ondeh-ondeh is boiled. 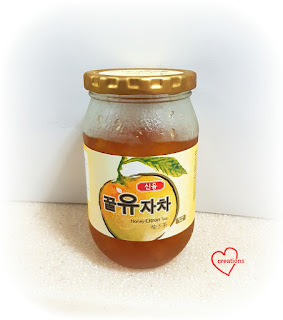 In order to replicate this effect, I had to create a thick gula melaka syrup that has the consistency of honey when refrigerated. Here's a rough formula I came up with. You may have to adjust your boiling time to get the right consistency. If it's too thick, simply add water a little at a time. I included salt in it to counter the sweetness. You may choose to omit if you want to be a purist about it. 1. Place all ingredients in a small saucepan and bring to a boil. Simmer for 2 minutes and let it cool to room temperature. 2. Discard Pandan leaf. Refrigerate the syrup for 10 minutes. Check the consistency. If it is too runny, transfer to saucepan and boil for a couple of minutes and bring to refrigerated temperature again. If it is too thick, add water 1/8 tsp at a time and stir until consistency is like honey. 1. Place white chocolate, butter and shortening in a microwave-safe bowl. Heat for 20 seconds and stir with spatula. Repeat until everything is melted. 2. Place cream, Pandan paste, caramel flavouring and lemon juice in a small saucepan. Heat until the cream starts to bubble. Pour over the melted chocolate mixture. Stir until well combined. 4. Freeze for 2 minutes and use a spatula to mix well. Repeat freezing for 1-2 min and whipping the ganache until the texture is smooth and creamy. You may use an electric mixer for larger batches. Don't worry if the mixture appears to separate in the beginning. Just keep freezing and whipping up the mixture and it will all come together in the end. This ganache on its own may taste weird but that's because it's supposed to be paired with something really sweet. 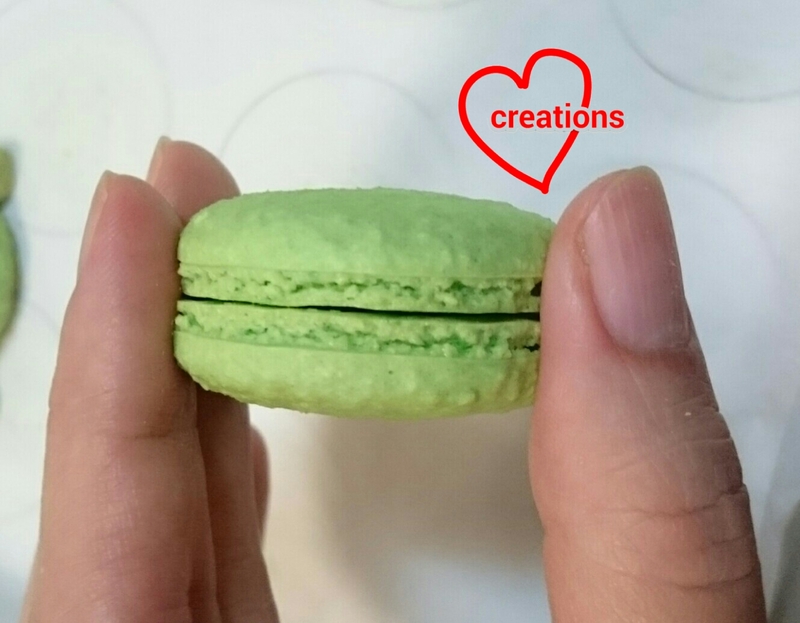 Assembly for the regular macaron shells is straightforward. 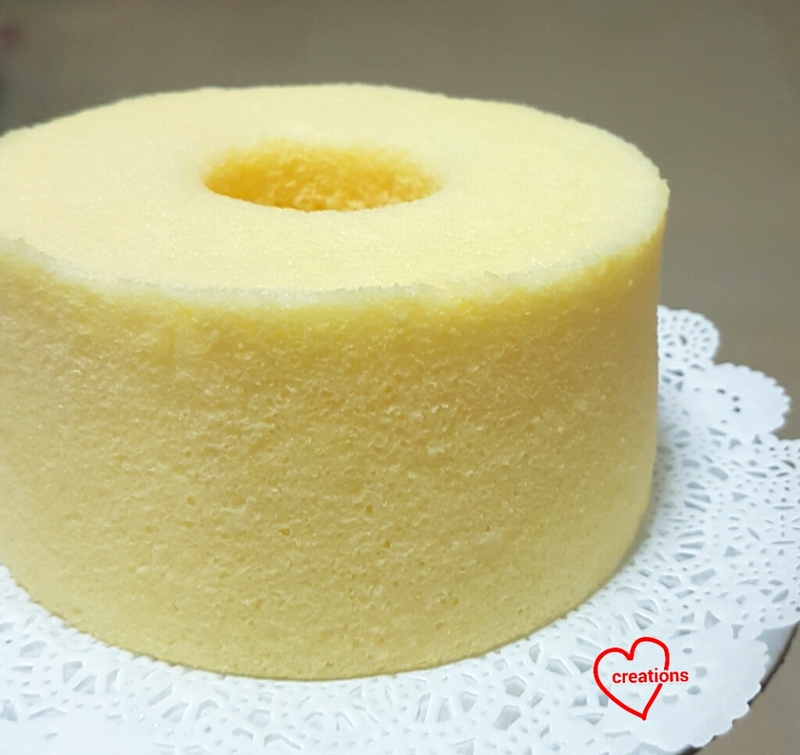 Pipe a ring of ganache and fill the center with gula melaka. Refrigerate at least 24h before serving. Leave the macarons at room temperature for 10-15 minutes before consuming. In order to fill the 3D shells, begin by coating the insides of the hemisphere with ganache (first picture below). 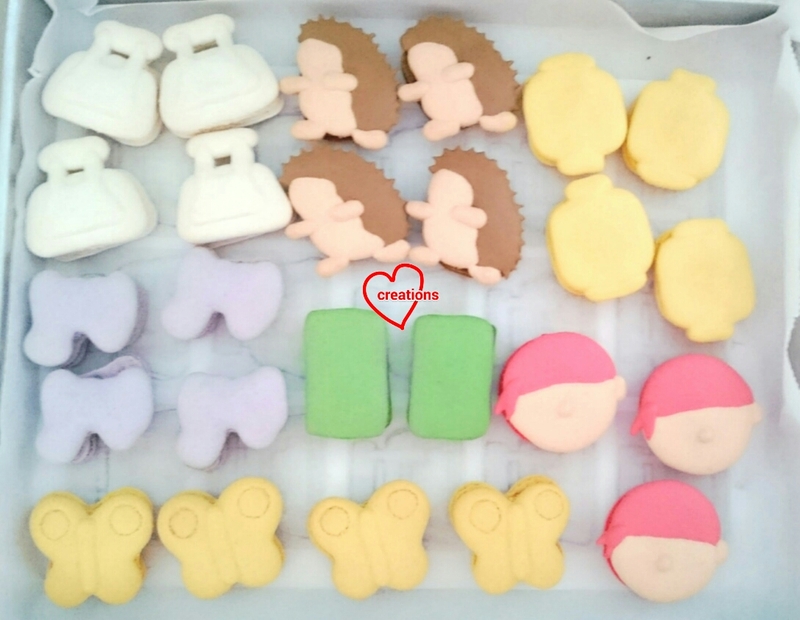 Fill the cavity with gula melaka (second picture). Cover the syrup portion with more ganache, such that the ganache completely "seals" in the syrup (third picture). Refrigerate the filled hemispheres for a few minutes to firm up the ganache. Use the cakepop mould to hold the shells in place. Pipe some ganache on the bottom shell (fourth picture) and sandwich the two shells together. This has certainly been a fun experiment and great learning experience for me :). It's a bonus that it turned out yummy too! Update: My friend who had one said it's very yummy! She couldn't wait for it to mature a day before eating it 😅. The turtle finally gets eaten by my younger kid! I am very pleased that this cross-section captures the beautiful macaron texture, creamy ganache and oozy gula melaka center very well! 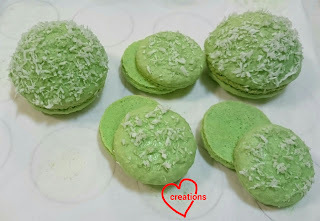 Checkout the Italian method version of Ondeh-Ondeh macarons over here! 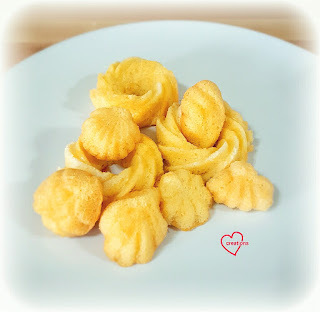 Kuih Bahulu or Ji Dan Gao, is my family’s favourite during Chinese New Year! 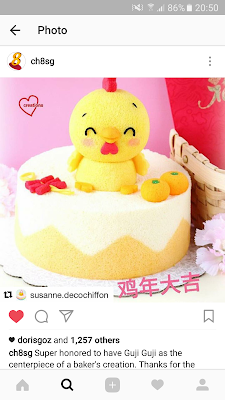 I actually started baking simple stuff during CNY before I started my creative chiffon journey. 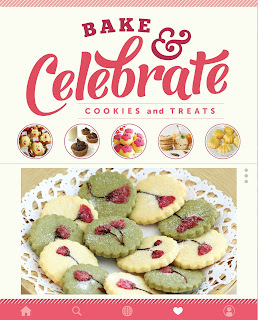 Today I have a date with some of my dear baking friends to share about our contributions to "Bake & Celebrate: Cookies and Treats", which is a cookbook compilation of various CNY cookies and cakes that has just been launched at all major bookstores. The contributed Kuih Bahulu recipe was my 3rd try on the recipe. 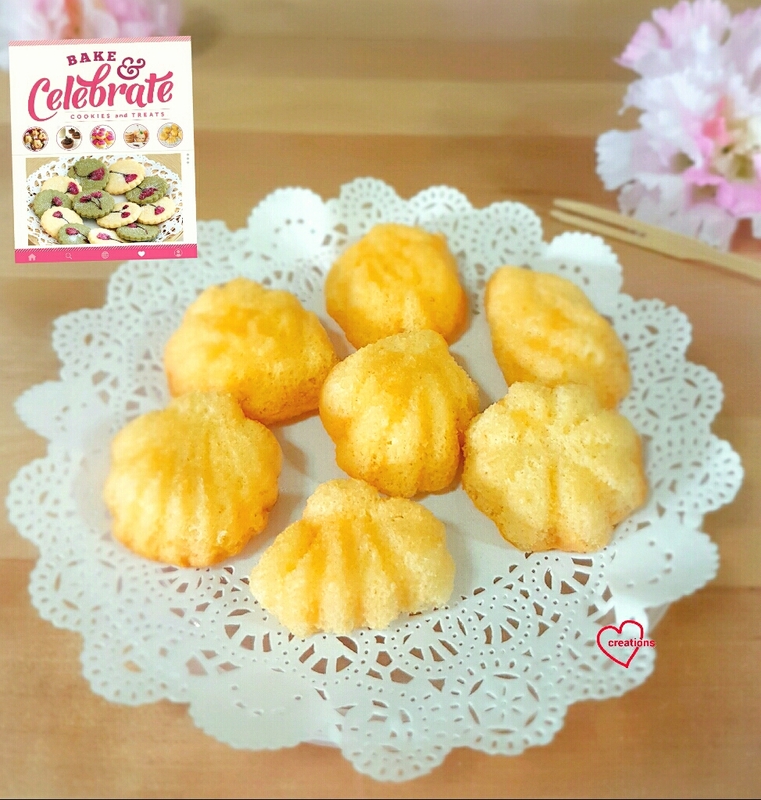 The feedback from family and friends is that it's moister and spongier on the inside, while retaining it's crispiness on the outside, so it's yummier than those sold in stores! I think it's due to the lower flour content I used in my recipe, which sort of follows my version of light chiffon cakes =p. So I'll like to share it with you. Baking temperature 190°C. For 9+ min. 1) Before using the flour, it is useful to sift the flour and baking powder 2x, as well as toast this flour/baking powder mixture lightly in the oven before using it to fold in. For a very light, crispy outside. 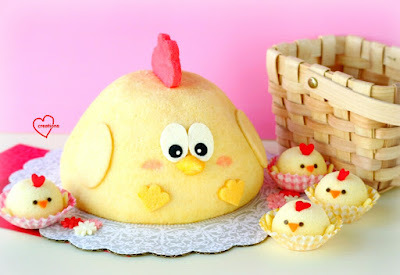 2) Whisk large egg with castor sugar and vanilla extract till ribbon-stage, before folding in the flour with baking powder lightly with a hand whisk. Ribbon-stage: this is very important for a very nice spongey inside! Folding in flour lightly with hand whisk: also very important for yummy, spongey inside! Do not overfold with a electric mixer. 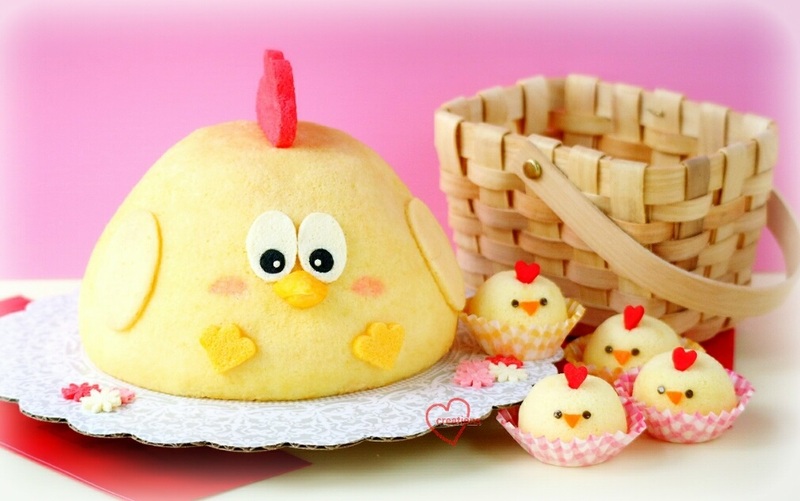 3) A high temperature 190°C and short baking time is used. For a brown crispy outside and moist spongey inside. 4) Lastly, it is very important to oil the moulds generously 2x, as well as preheat the moulds with the oil for the cakes not to stick, as the cakes stick easily. 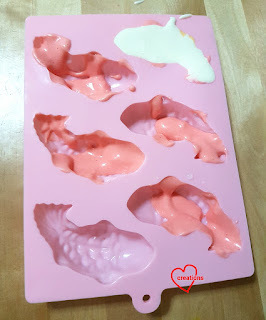 As usual, being a little free-spirited in my baking, I have baked these in both traditional aluminion molds (from baking shops), as well as silicone molds and muffin pans. Yes they work and taste equally yummy!! Those from the bundt pans are very pretty especially! 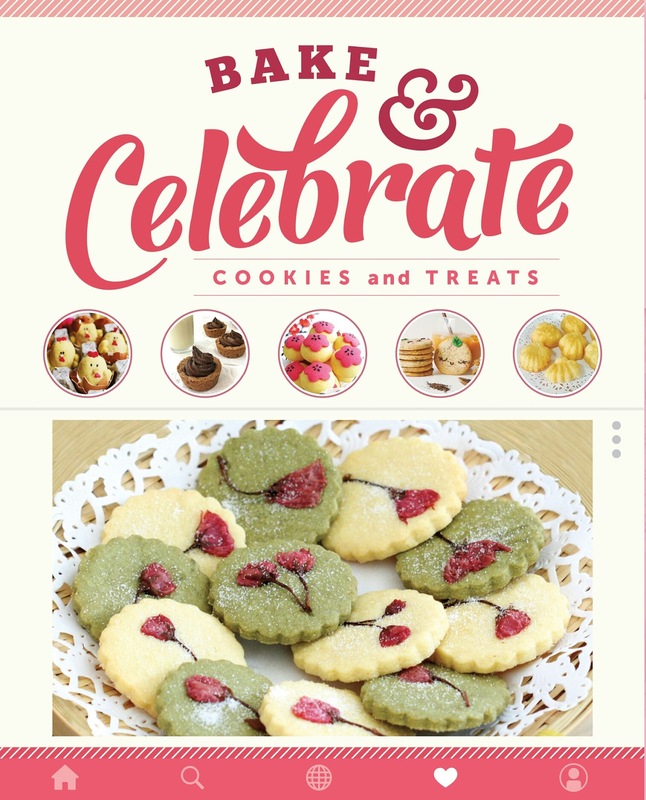 The recipe with many other cookies and treats from other baking friends are in Bake & Celebrate (published with Marshall cavendish), available at all major bookstores. 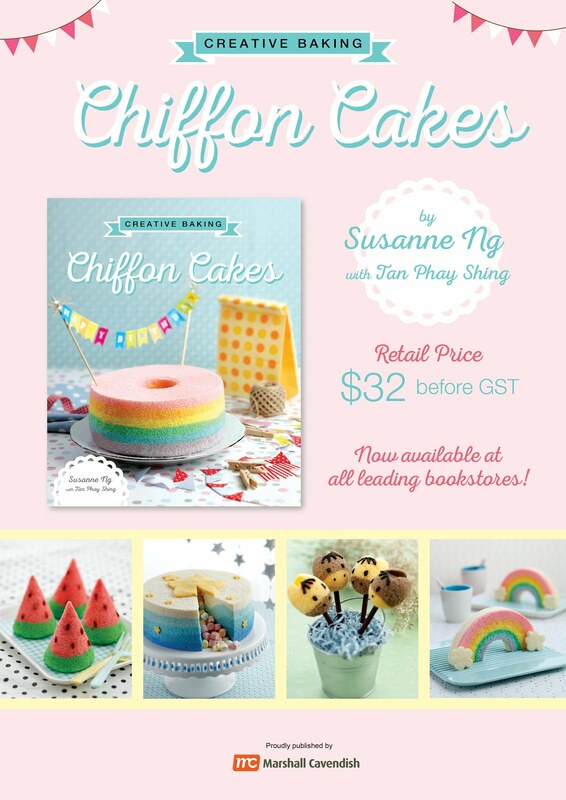 The book is retails at $14.90 and is a nice, small handy-size unlike my chiffon cake books. I've also made a book flip video on my Instagram stories for today. 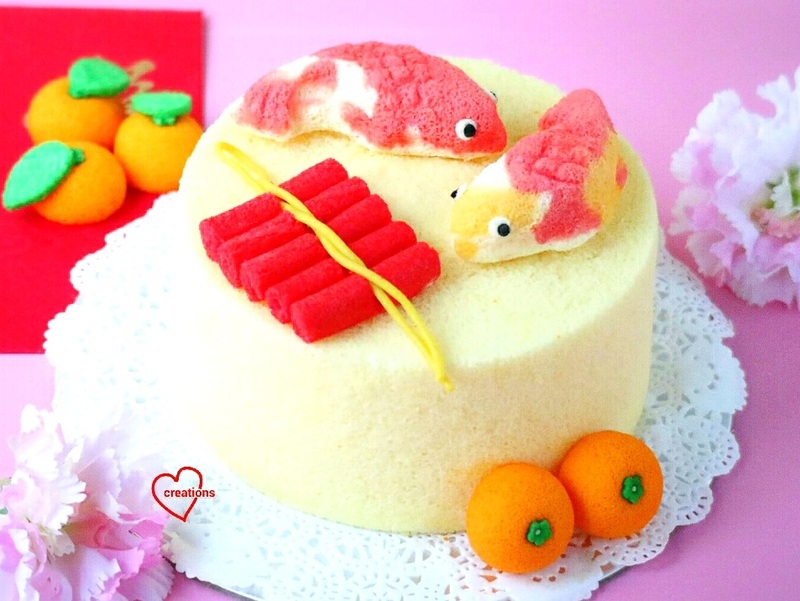 Wishing everyone 新年快乐 in advance! My friend requested for the mandarin orange cupcakes this year and it's the largest quantity I have baked for a request so far. 20 mandarin orange cupcakes! 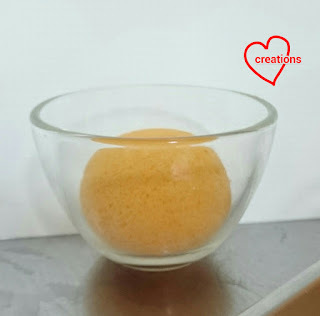 Since I don't have that many glass bowls, some of the oranges were larger using a 11cm OD bowl instead of my usual 8.5cm ones. I needed two rounds of baking to complete the oranges. 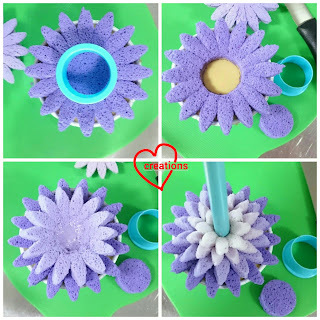 Gently tuck the base of the cake (near the rim of the bowl before unmoulding) into the bowl and leave it in there for 15-20 minutes before taking it out. The bases will be very neatly tucked in! I used this neat trick for the head and body of the roosters as well! 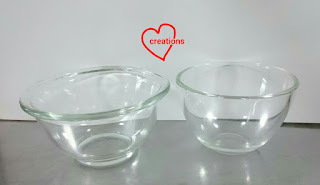 I baked the heads in 8.5cm OD bowl and the bodies in 11cm bowl. The other parts of the roosters were baked as sheet cakes in a 7" square tray and cut out using cookie cutters. Check out the neat rounded bottoms of the cakes! Assembling the head into the body with melted marshmellow and toothpick. 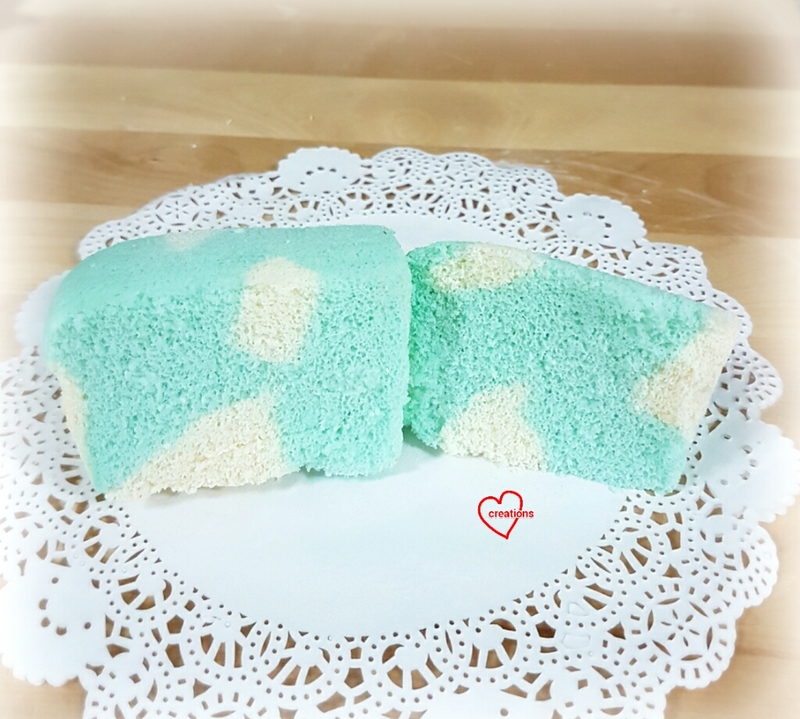 The recipe for yuzu chiffon cupcake can be found here.